Dreaming of home ownership and giving up the rental lifestyle? Stop right now. While well-meaning aunts might be telling you that you’re “throwing money away every month,” there’s a lot to be said for the benefits of apartment living. Sure, your upstairs neighbors might seem like they’re out to rob you of much-needed sleep with late-night heavy-furniture moving, but the freedom that comes with renting shouldn’t be taken for granted in the great rent or buy debate. There’s nothing like calling up someone else to take care of any and all household problems. (Do you want to figure out how to replace a leaky roof? Probably not.) And finding a home with a pool and a clubhouse requires an income bracket most of us don’t enjoy. Plus at the end of the day (or lease), if your apartment isn’t cutting it, you can always find somewhere else to live with little notice. Try doing that with a home, and the bank won’t approve. It’s one thing to repair a clogged sink or toilet. It’s another entirely when the staircase collapses, you have to deal with an electrical fire and critters have made themselves at home in the walls. If you’re into the romance of old houses, be sure to watch The Money Pit before signing on any dotted lines with realtors and lawyers present. There’s no better movie to dramatize the toll homeownership can take on your wallet and your relationship. When you own a home, you’re on the hook for any and all repairs. And unless you’re OK with some kind of descent into Grey Gardens-type madness, it can be, well, stressful. You don’t get a super if you don’t live in an apartment. People love to talk about their dream homes, but dream houses aren’t always everything they’re cracked up to be. Sure, you could end up living with your family in suburban bliss for the rest of your life. You could also end up fighting a demon that has staked his claim on the basement and won’t let go. For more information on the latter, see The Amityville Horror. 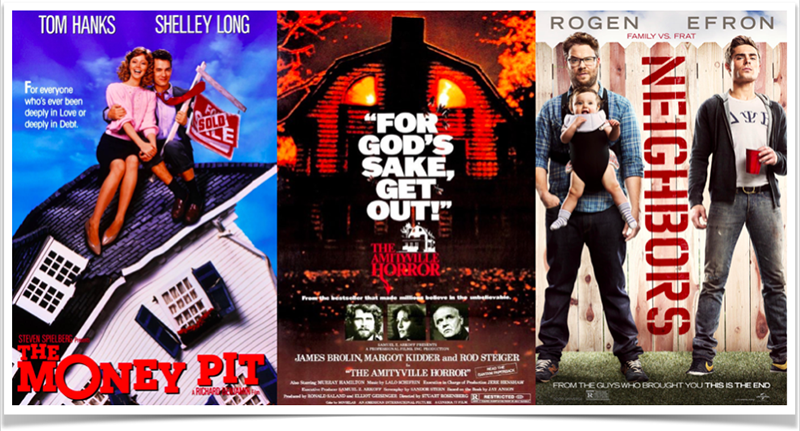 In not one, but fourteen films based on real-life events, cameras document a mystery that began when the Lutz family took up residence in a home that had previously been the scene of a mass murder. Do you hear about haunted houses? All the time. Do you hear about possessed apartments?Not a thing. Avoid evil entities. Stick with apartments. Now, for this one, you’re probably thinking, “But I have terrible neighbors right now!” And you might. But the beauty of renting near terrible neighbors (and we know a few) is that eventually, one of you will leave. When you buy next to terrible neighbors, or they come in after you, it’s a whole different ballgame that can involve spite, criminal noise complaints and decreased property values. Just watch Zac Efron and Seth Rogen in Neighbors. Do you have time to spend your nights destroying friendships at frat parties? Probably not. Do you want your children growing up next door to wet t-shirt contests? Again, we’re thinking that’s probably a negative. Save yourself the headache of years of passive-aggressive neighborhood relations. Keep renting.